Whether you’re planning a new website or just redesigning a current one, we know you want it to be user friendly, super organized and look great. Pre-planning is very important in designing an exceptional website, so we at Slickplan have created a powerful toolset that helps you visually design website sitemaps and more. Create website sitemaps first. This step will save you time and improve the quality of the end result. Create sitemaps using our intuitive drag and drop interface, and get off to a quick start. Organize and test your pages and content visually as you rearrange them exactly how you want them. Slickplan engineers are continually adding new and exciting features in our quest to provide the best sitemap creation experience on the planet. Utilize our feature-rich platform to create a sitemap for your next website. Create sitemaps with custom colors and lines, and add your company logo and color palettes to further brand your sitemap and app interface. Export and share your sitemap designs with colleagues or clients in a variety of file formats. Send direct links to an HTML version with public access via email, social media, etc. Seamlessly connect Slickplan with your Basecamp projects to share updates automatically. You need only one tool for collaborating with others on site mapping projects. Multiple users can edit sitemaps at the same time, and modifications are made instantly. Conveniently chat directly with others working on your sitemap through the Slickplan interface. Use additional features to grant approvals and lock completed work to prevent overwrites once changes are finalized. Easily integrate Slickplan into your workflow by using our WordPress or Joomla! plugins, Basecamp integrations, or Developer API. As a freelancer, designing websites presents additional challenges beyond the sitemap itself. Slickplan allows you to brand your sitemaps and share them with your clients to help win business, educate clients on strategies, and formalize action plans. 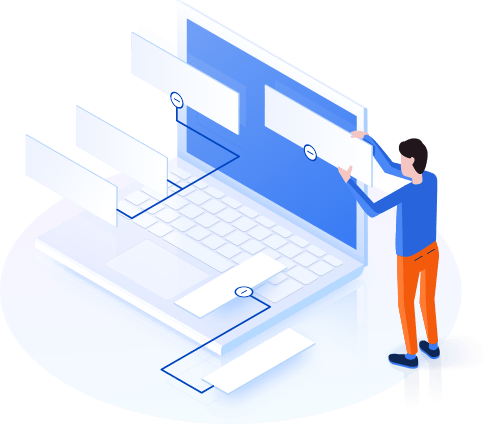 Slickplan makes it easy to quickly plan projects for an unlimited numbers of clients, conveniently share sitemap designs within an agency or team and directly with a client and utilize powerful versioning and approval process features. Whether your site is five pages for a small startup or a thousand pages for a large organization, Slickplan’s sitemap design tool allows you to easily get organized. Keep track of your pages and page content, direct user flow, and outline site structures. There are different types of sitemaps with their own uses. See why they are important in modern web design practices. Get started designing your own sitemaps from a strategic perspective. Begin with an intuitive methodology. Visually designing sitemaps is important in properly planning your website. Learn how a Visual Sitemap Generator works. See the full features list for Slickplan’s sitemap builder. Look under the hood and see what our app can do for you. Learn about additional helpful tools from Slickplan that will make your sitemap creation experience a breeze. Get some helpful information about perfecting your website’s structure including perspectives on planning, information architecture and more. Check out our always free sitemap tool and get access to basic features. Upgrade to a 30-day free trial at any time to test out the entire suite of features.